Zunar’s trial is scheduled to begin on Wednesday, May 20th. [UPDATE: Zunar’s trial date has been moved to July 7] He has been charged with nine counts of sedition over a series of tweets the cartoonist made in February following a court decision in a case involving opposition leader Anwar Ibrahim. 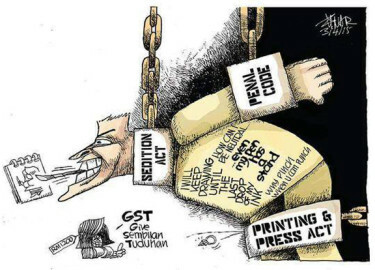 Zunar faces a possible 43 years in prison if found guilty. The entire Martin Rowson/Zunar interview can be heard at Index on Censorship’s website.